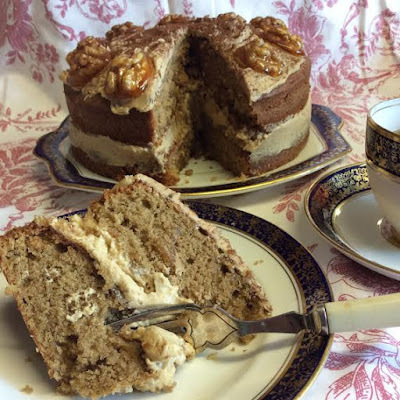 Home » dessert » dessert/cake/chocolate » The BEST Coffee and walnut cake....EVER!!!!! 75mls black coffee, made with 2 tablespoons instant coffee granules- remove and reserve two tablespoons to use in the mascarpone filling…. Preheat the oven to 180c or 160c for a fan oven and grease and line 2 x 20cm cake pans. Place the butter, brown sugar, flour, baking powder, eggs, coffee infused liquid (minus the two tablespoons) and vanilla essence into a bowl and beat with an electric mixer until light and fluffy then fold in the chopped walnuts. Divide equally between the two prepared tins and bake in the preheated oven for 25-30 minutes or until well risen and firm to the touch. Cool. For the filling- Place the mascarpone, double cream, icing sugar, vanilla essence and the remaining two tablespoons of coffee infused liquid into a medium sized bowl and whisk until the mixture holds firm peaks, use to fill the two cakes. For the caramelised walnuts- place the caster sugar into a small non stick saucepan with the water and bring slowly to the boil, stirring all the time to dissolve the sugar crystals then remove the spoon and boil the syrup rapidly until you get a golden brown caramel. Drop the walnut halves in and coat them with a fork then remove and place them individually onto baking parchment or a silicone sheet, leave to cool. For the water icing- place the coffee granules and boiling water into a small bowl and stir until dissolved then add the icing sugar until you have a smooth spreadable consistency, spread over the top of the cake and position the cooled caramelised walnut halves around the edge, leave to set then dust with the cocoa powder is using. 0 Response to "The BEST Coffee and walnut cake....EVER!!!!!"